Advaita Vedanta refers to the non-dualistic school of Hindu philosophy, which is derived mostly from the Upanishads and elaborated in detail by eminent scholars like Gaudapada and Sri Adishankaracharya. Dvaita means duality, and Advaita means nonduality. In simple terms, Advaita means absence of the duality between subject and object. In our wakeful consciousness we experience duality, but in deep sleep only nonduality. Advaita school believes that Brahman is the one and only reality and everything else is a mere appearance, projection, formation or illusion. One of the most common examples used to describe the state is momentarily seeing a snake in a rope when it is lying in the darkness. The snake is an illusion, and the rope is the reality. In the same manner the world appears in the mind as a formation over the Self. The school also believes that Atman, the individual self, has no separate existence of its own. It is but a projection or reflection of Brahman only in each being. A jiva is deluded soul by egoism, desires, and other impurities and thereby experiences duality and separation. Because of it each being is bound to the cycle of births and deaths and the laws of karma as long and remains so until liberation is achieved. Brahman is real, but the world in which we live is a mere illusion, like a mirage. It appears in our consciousness because of the activity of the mind and the senses. Since we totally depend upon them, we do not perceive Brahman, the ultimate reality, who is hidden in all. When they are fully withdrawn and made silent through detachment, purity and renunciation, one can see the Supreme Self hidden in all and attain liberation. Advaita Vedanta believes that an enlightened guru, having the knowledge of both the scriptures and Brahman, is indispensable for anyone seeking salvation. Mandukya Karika of Gaudapada is considered to be the first available treatise on Advaita Vedanta, while the monumental works of Shankaracharya constitute its core literature. Successive generations of scholars enriched the school of Advaita through their teachings and scholarly works. Advaita school also forms part of Vaishnavism, Saivism and Shaktism under different names. A few important concepts of Advaita Vedanta are presented below. Sadhana Chatushtayam means the tetrad which are imperative for spiritual practice and liberation. The following four sets of qualifications are considered essential to achieve salvation, which each aspirant is expected to cultivate. Nityanitya vastu viveka: The ability to discriminate between what is eternal (nitya) and what is temporary (anitya). The absence of it is responsible for the delusion. Ihamutrartha phala bhoga viraga: Disinterestedness in enjoying the fruit of one's actions and sense objects here and here after. This will arrest the continuation and formation of karma. Sama adi satka sampatti: Qualities such as sama (control of internal sense organs), dama (control of external sense organs), uparati (abstinence), titiksha (quietness), sraddha (sincerity and faith) and samadhana. They are important for self-transformation and the predominance of sattva, without which one cannot be free from the triple impurities of egoism, attachments and delusion. Mumukhatva: Intense aspiration for salvation. It arises mainly due to the good works (karma) in the past. According to the Bhagavadgita only after repeated births a person feels a strong drive to achieves salvation and turns to the path of salvation. They are the standards of ascertaining right knowledge, truth, or valid knowledge. In this world duality it is very difficult to know which is right knowledge and which is reliable for salvation or to ascertain truth. Advaita Vedanta recognizes six Pramanas, of which three were proposed by Shankaracharya and three by his followers. They are as stated below. Pratyaksha: knowledge that comes through perception. This is objective knowledge which is experienced directly either through the senses or in deeper states of consciousness. Anumana: knowledge that comes by means of inference. This is speculative knowledge based upon supposition or belief. Upamana: Knowledge that comes by means of analogy, comparison and contrasting. This is relational knowledge. Arthapatti: knowledge obtained by meaningful assumptions based on common sense and previous experience. This is hypothetical knowledge. Anupalabdhi: Knowledge gained through negation. Agama: Knowledge that comes through study of scriptures. This is pure theoretical knowledge. Advaita Vedanta recognizes two forms of causation, the material cause and the instrumental cause. According to the school Brahman is both the material and instrumental cause of creation. In other words, Brahman provides not only the will and direction but also the material and energy needed to manifest the things, beings and worlds. Brahman is both Purusha (Self) and Prakriti (Nature).This is in contrast to some schools of Hindu philosophy, which argue that Brahman is the instrumental cause while Prakriti or nature is the material cause. Adi Shankaracharya proposed that each cause was hidden in its every effect, whereas the opposite was not true. In other words, the seed is hidden in the tree that produces it. While a cause is not different from the effect it produces, the same cannot be argued in case of effect in relation to its cause. A cause is always part of the effect, hidden within it and so is not different from it. Brahman is the cause of all creation. So the world is real only because Brahman, who is its cause, is hidden it and inseparable from it. From this perspective the world becomes an illusion because it disappears when the Self or Brahman is withdrawn from it. The world exists when you, the cause, are present in your mind. When you, the cause, withdraw from it, the world disappears. 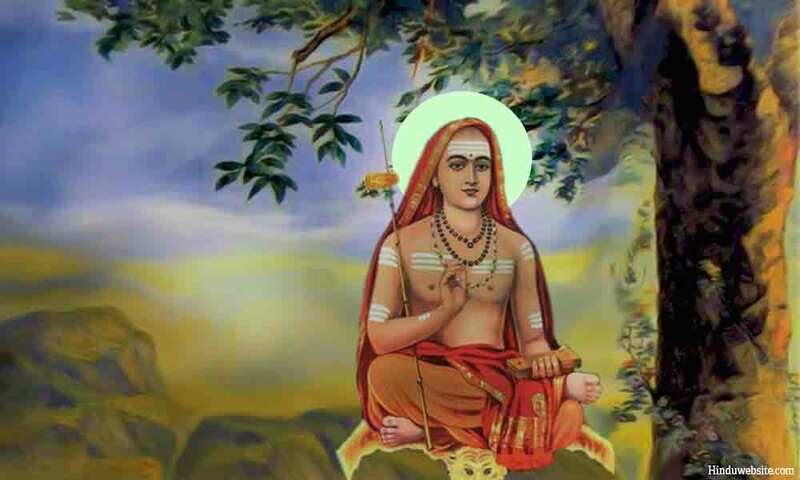 Shankaracharya propounded the theory of causation (vivartavada). According to it an effect is an outward projection of cause and hence not real. This is in contrast to the parinamavada concept according to which an effect is an evolution or transformation of cause and hence as real as the cause itself. According to Advaita Vedanta the world is an illusion or maya, which is caused by the veiling power of Brahman. It is unreal or illusory in an absolute sense. Since it is a projection of God's consciousness, it disappears when it is withdrawn. The veiling is called avarna and the projection viksepa. Followers of Advaita argue that maya is neither real nor unreal, but indeterminate or indescribably (anirvachaniyam) because it cannot be both at the same time. Brahman is the supreme, absolute and eternal reality. It is the only truth, the cause of all, and the only stable and permanent reality. Atman is Brahman, perceived as individual self, the hidden reality, in all aspects of creation. There is no difference between the two. When the Self overcomes its veiling, it experiences non-duality (Advaita anubhava) of existence and realizes its non-difference from the Absolute. Brahman in his absolute state is without qualities and attributes. However, in our relative state we perceive him to be having certain attributes and refer to him as Isvara, the lord of the universe. In the ultimate sense, Isvara is also not the cause, but only an effect or a reflection of Brahman in the quality of Sattva. According to Advaita, the world is unreal, not because it does not exist, but because it exists only so long as the Self is present in the awareness as the subject. When the Self is withdrawn from the consciousness, the world disappears. Besides it is ever changing, unstable, impermanent and subject to destruction and decay. It is an appearance, projection of God, like a mirage, or a mistaken reality. Our senses take it for granted whereby we mistakenly consider it real and permanent. The world exists because of our perception of duality and will disappear when we enter the state of non-duality or pure subjectivity, which is the state of the Self. When we overcome the illusion and develop detachment from the sense objects we enter that state of pure awareness where the duality between subject and object, or the knower and known simply vanishes and the Self alone remains. Some argue that Shankaracharya was inspired by the teachings of the Buddha, especially those pertaining to the school of emptiness (Shunyavada), in postulating the theory of nondualism. It may not be true because Buddhism does not believe in the existence of Self. It is true according to both schools, a being become empty upon liberation. According to Buddhism nirvana is an indeterminate state in which all traces of individuality disappears. According to Advaita, upon liberation the individual Self which is present in the being as a projection of Brahman becomes withdraws and the being vanishes into the ocean of existence as nothing. Shankaracharya was preceded by many Vedic scholars who followed the path of nondualism. For them it was not just a speculative theory, but a means to salvation. Shankaracharya followed an ancient Upanishad tradition that upheld the school, and probably belonged to a teacher tradition which followed it. For the next thousand years his teachings and numerous works became the standard for the school of Advaita. However, the works of Shankaracharya were not accepted by all Indian scholars. He was severely criticized for this stand on Advaita by those who followed Dvaita and Vishishtadvaita. Even Advaita there are many variations. Most of these schools came into existence as alternative philosophies or viewpoints, based upon their opposition to Advaita or their criticism of it. Adi Shankara's works on the Upanishads, the Bhagavad Gita and the Brahma Sutras greatly helped in understand the subtle nuances of Advaita. Although, they were mostly translations and commentaries or were based upon existing works, you can still find in them original ideas and interpretations. Critics of Shankara argued that he taught a version of Buddhism as Advaita. In Buddhism liberation arises from the insightful realization that the world is a mere appearance or a phenomenon. When one gains that insight he reaches the changeless, deathless, absolute state that cannot be described. In Advaita, liberation arises from Self-realization or the realization that only the Self is real and everything is a mere appearance or phenomenon. Thus, the concept of Maya in Advaita is rooted in the eternal reality of Brahman, but not just in the temporary delusion of the mind, which is the case with the Buddhists. It is also probably untrue that Shankaracharya was instrumental in the decline of Buddhism. It started long before the emergence of Shankaracharya, at least by three hundred years of so. By the time he was born, Buddhism was already on decline and many Buddhist places of residence (aramas and Viharas) which were in a state of neglect were occupied the ascetic groups of Shaivism and Vaishnavism. It appears that by his time many Buddhist places of worship were converted into Hindu shrines. It is true that through his travels, debates and discussions he consolidated the revival of Hinduism. It served a great cause in preserving Hinduism when organized religions such as Islam and Christianity came to India and seemed to threaten its very existence. Shankara's Advaita or his theory of nondualism, provided a level playing field for the Hindus during the Islamic rule and contributed to the synthesis of new movements such as Sufism.